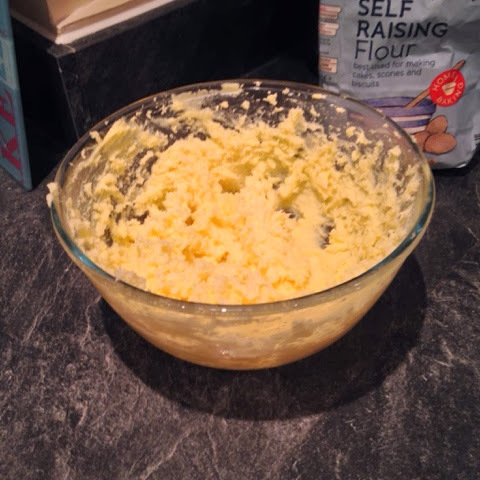 I was both excited and worried by the announcement that the first topic in the Reddit 52 week baking challenge was cookies. Excited because I love eating cookies; worried because I'd never attempted them before, and usually my "first go" at a new recipe goes horribly wrong (Nigella's cinnamon buns - I'm talking about you). 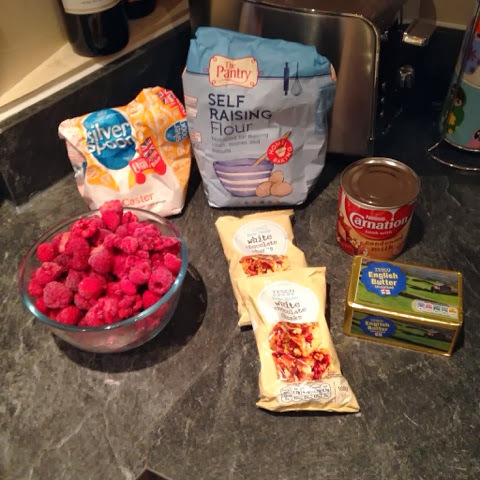 After a quick Google, I decided on white chocolate and raspberry, partly because the recipe (found here - http://www.carnation.co.uk/Recipes/58/Raspberry-and-White-Chocolate-Chunk-Cookies ) called for condensed milk, an ingredient I'd been keen to try for some time. Here's my ingredients, slightly different to those given in the recipe. I went to two different supermarkets and they had both sold out of fresh raspberries, so I had to use frozen. I also used chunks of white chocolate, because I couldn't be bothered to chop up big bars of Milky Way. Mixed it all up with an electric hand mixer. 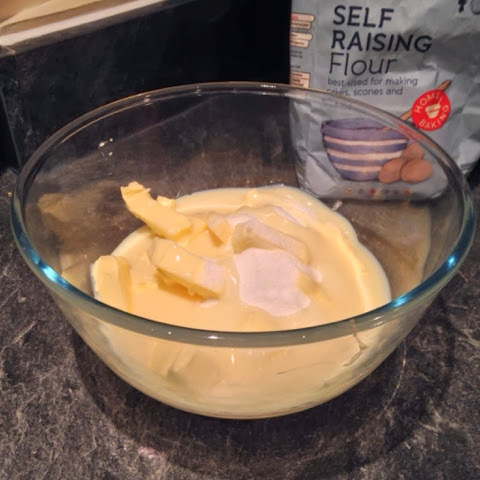 At this point I realised the butter wasn't really soft enough, so I chucked the whole bowl in my pre-heating oven and made a cup of tea. A few minutes later it was good to go. 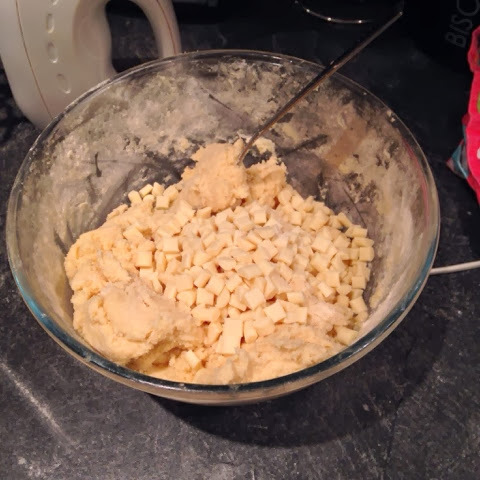 Mixed it up until it looked like a dough, then added the white chocolate chunks. I taste tested a few of the chunks first, you know, for science. This is where it got a bit confusing. 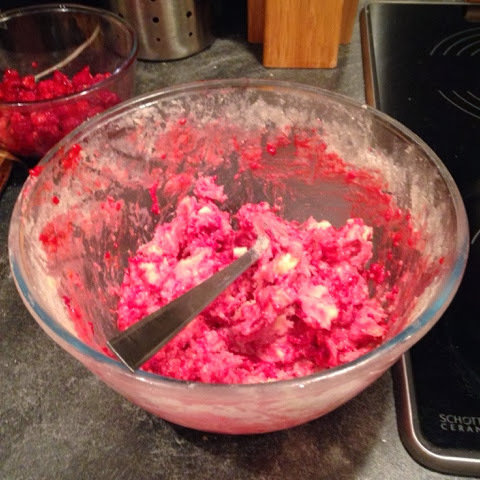 The recipe said that I should scoop up a bit of the mix, flatten it out, add a couple of raspberries, then squash it back into a rough ball shape. 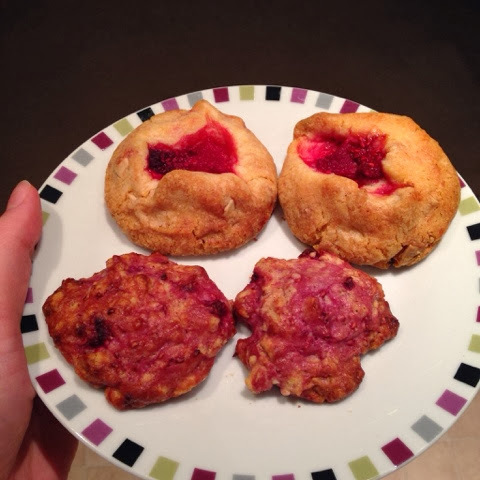 I don't know if it's because I used frozen raspberries, but this was very hard work! 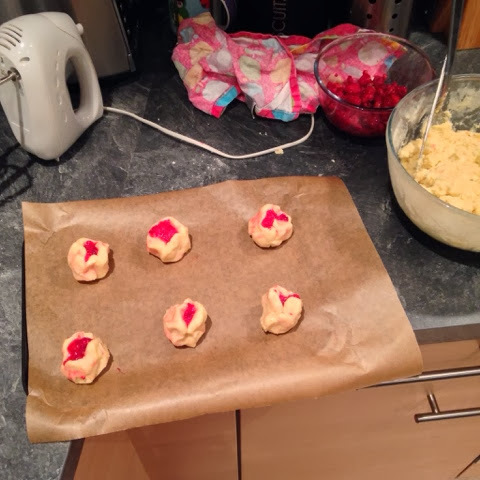 As soon as I started squashing the cookies back together, the raspberries on the middle basically exploded. I ploughed on regardless, not about to let some soggy raspberries ruin my evening. 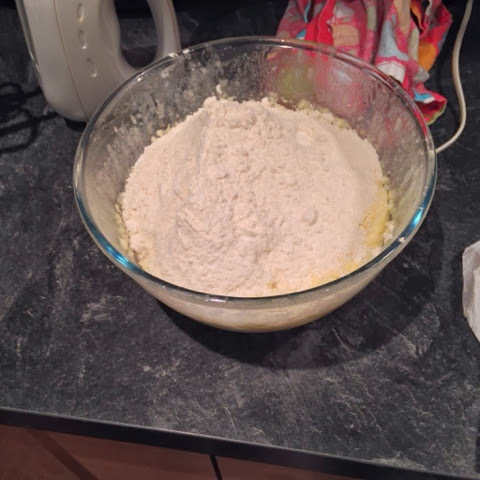 ...I got fed up with the whole "carefully place the raspberries into the dough without destroying them" lark, and mixed the rest of them into the remaining dough. Good thinking on my part I feel. I had to spoon these ones onto baking trays as the mixture was now decidedly wetter. They also needed even longer in the oven, more like 35 minutes. But they taste just as good as the good looking ones, honest. 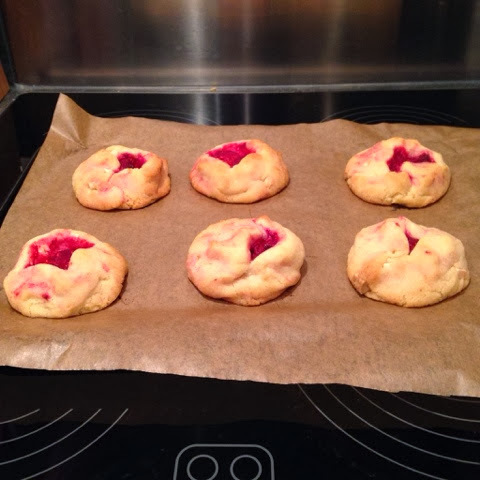 So here's the final result, two cookies for the price of one!